Getting together with others to swap ideas, plants and resources can be a good way of motivating yourself. 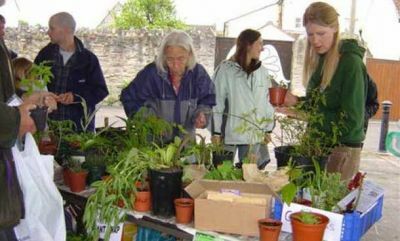 G3, the Glastonbury gardeners group runs seed and plant swaps for local gardeners, and collaborates wtih others to run the Glastonbury Harvest Show. Motivation: Inspired by other groups around the Country the seed swaps were set up to try and preserve heritage varieties and to encourage gardeners to be self reliant. The seed swaps benefit local gardeners by facilitating the swapping and sharing of resources and ideas. Practicalities: The group says the process has been fun and rewarding with membership growing at every single event, and an abundance of people wanting to help out. Other sustainable elements: As well as encouraging people to grow their own food, the group promotes many other ideas that lead to more sustainable lifestyles. It is very local in its ethos and holds all events in the town so people can easily attend without using a car. A large percentage of the group tend towards organic method of gardening and a number are involved in permaculture design in their gardens. The group promotes recycling and re-use of plants and other materials in the garden swaps and most of the group compost their own waste to use on their gardens. They strongly believe that growing your own food is a practical solution to the energy usage of current food and packaging systems and that saving your own seeds is the only truly sustainable way to garden. It also means not having to rely on big businesses whose activities we cannot control.